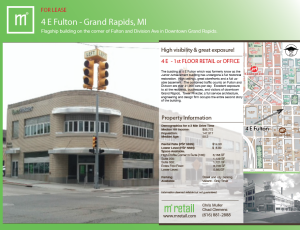 The buidling at 4 E Fulton which was formerly know as the Junior Achievement buidling has undergone a full historical restoration. High ceilings, great storefronts and a full usable basement. The combined traffic counts on Fulton and Division are over 41,000 cars per day. Excellent exposure to all the residents, businesses, and visitors of downtown Grand Rapids. Tower Pinkster, a full service architecture, engineering and design firm occupies the entire second story of the building.